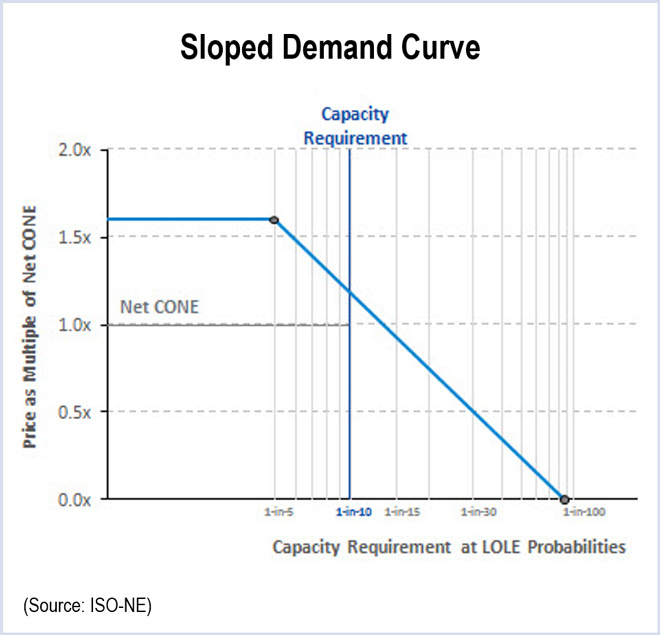 The New England Power Generators Association says ISO-NE should adhere to a planned change to a sloped demand curve in the next Forward Capacity Auction (ER14-1639). NEPGA has asked the Federal Energy Regulatory Commission to clarify a previous order that directed the RTO to continue the effort to eliminate the need for administrative pricing in zones that are short of generation resources or suffer from transmission constraints. NEPGA is asking the commission to initiate a Section 206 proceeding and order ISO-NE to file the sloped zonal demand curves developed by the RTO and New England Power Pool stakeholders. “Market participants have expected for over a year that their participation in FCA 10 would be based on both system-wide and zonal sloped demand curves. Clearing capacity resources on a curve better reflects the incremental value of capacity and leads to a more efficient market outcome,” NEPGA wrote. NEPOOL joined ISO-NE in asking FERC to reject a request by generators to force the RTO to develop a zonal sloped demand curve design for FCA 10. FERC ruled that the ISO-NE Tariff is unjust and unreasonable because it uses vertical demand curves in constrained zones. New England power generators asked a federal appeals court to overturn FERC orders that accepted ISO-NE’s change to a sloped demand curve in advance of this year’s Forward Capacity Auction.